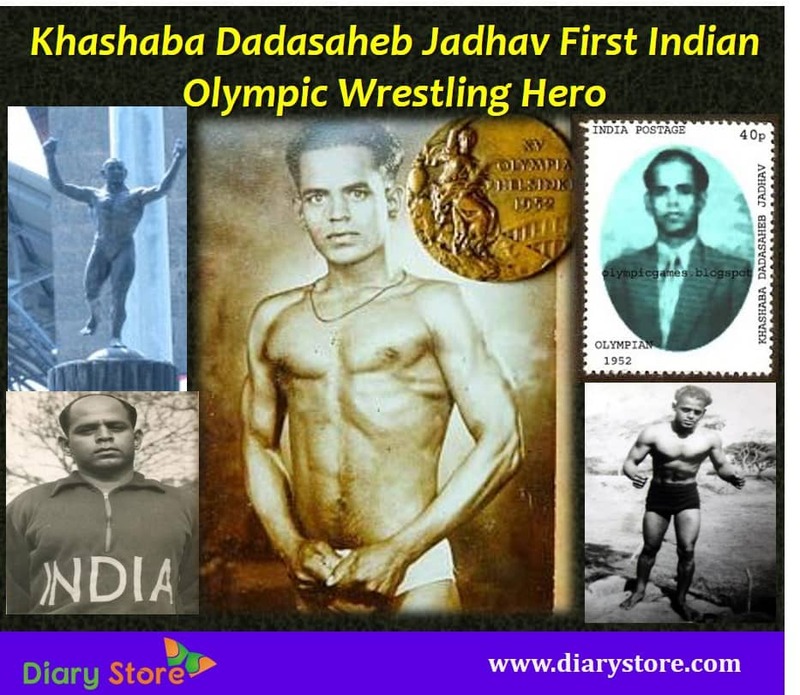 Khashaba Dadasaheb Jadhav was an Indian athlete. He was born on January 15, 1926 in Goleshwar village, Satara district, Maharashtra. Khashaba Dadasaheb Jadhav won a bronze medal in men's wrestling freestyle bantamweight category on 1952 Olympics in Helsinki. He is the first individual athlete from India who won the Bronze medal in the Olympics. Khashaba Dadasaheb Jadhav’s life inspires many to achieve success with grit and determination. Here is Jadhav’s complete inspirational story for all. Indian government released the postal stamp with the name of Khashaba Dadasaheb Jadhav. Khashaba Dadasaheb Jadhav was born in Goleshwar. His father’s name was Dadasaheb Jadhav. Jadhav’s father and grandfather were also wrestlers. Jadhav was a gentle-spoken guy, who never lost his cool, even in pestering circumstances. Jadhav had a very good encouragement from his father. Jadhav had four brothers; his father tried to send all his five sons to practice wrestling but among all of them Jadhav alone had the excellent spark in the sport. Jadhav had a son by name Ranjit. Jadhav’s house name also had the identity of bearing colloquial name Olympic Niwas. The living room in the house is full of trophies, medals and mementos. The walls of the room are covered with photographs. The most imposing of them is a large photograph of Khashaba Dadasaheb Jadhav, standing on the podium during the prize ceremony of the 1952 Olympics. In final days, sadness crept in his life when Jadhav’s final pay scale at the time of retirement had come down to around Rs 2,200. The lump sum amount he got on his retirement was Rs 75,000. In spite of his worldwide reputation, during old age, his financial condition became so poor that in 1984, when Jadhav constructed his house, he had to sell his wife’s gold ornaments to meet the expenses of construction. Jadhav’s father, Dadasaheb (wrestler) introduced him to the sport when Jadhav has five years. Wrestling bouts were common at village fairs and his father was very confident about his physical stamina and made sure that Jadhav learnt early to face the dangal. Young Jadhav rarely lost a game. Dadasaheb soon undertook to train him in the akhada in Goleshwar. After his primary education, Jadhav took admission in Tilak High School in Karad, it is 5 km from Goleshwar village. His village was located in the most backward rural area and it had no basic means of transportation at that time like buses, motor cycles or train facility. There was no sufficient transportation from school to village so he would run the the entire distance to school. Two of his teachers, also wrestlers, trained him and prepared him for state-level and national-level competitions. Jadhav lost a few years, however, in pursuit of academic career until graduation, which was rare for wrestlers those days. In 1948, Jadhav was at Raja Ram College, Kolhapur; a short, bony student from a nearby village walked up to the sports teacher and said he wanted to become a capable contestant in wrestling at the annual sports meet. Jadhav’s teachers criticized and ignored his request to participate in annual sports meet at his college due to his insufficient height and lanky physique. Eventually, one fine day, Jadhav approached the college principal, who gave him another chance. That was just the opportunity Jadhav needed to prove naysayers wrong. In bout after bout, he felled bulkier and stronger wrestlers to win the event. Earlier to making it big as a wrestler, Jadhav played a crucial role in India's freedom warfare. He furnished safe haven and hiding shelter to revolutionaries all through the 1942 Quit India movement. He used to, reportedly, circulate letters and literature against the British Empire. The freedom struggle gave him a purpose in life on August 15, 1947 - to unfurl the Indian tricolor flag on the Olympics. In 1948, throughout a state-level wrestling championship where Jadhav was the one of the consistent challengers stayed on, after the organisers declared one rupee as the prize, so scornfully low and disproportionate to the status of the programme. Other players would have felt offended and walked out and Jadhav was pitted against Rakshe, a stocky wrestler from Mumbai. Jadhav defeated his opponent within seconds. Jadhav used to practise on the mats available in India which were made of coconut husk and quite rough. It’s remarkable that someone who practised on mud and coconut husk mats made a mark internationally. In Lucknow, in the year 1952, Niranjan Das of Bengal was over 6 ft. tall, a machine of muscle and power. Going into the match, Jadhav, around 5.5 ft. tall, was clearly the underdog. But within seconds, he had Das pinned to the ground. Stunned, Das argued that he had not been ready for the bout, and asked for a re-match. But Das lost again. Despite having defeated Das, Jadhav found himself being overlooked in the squad for the 1952 Olympics. Jadhav wrote to the Maharaja of Patiala, who was a patron of wrestling, and had a say in the selection. The Maharaja convinced authorities to hold a bout again. For the third time, Jadhav triumphed over Das and qualified for the 1952 Helsinki Olympics. Before the 1952 Helsinki Games, Jadhav had another challenge to face. In one of the glass cases of Jadav’s living room are displayed laminated copies of old, sepia-tinted receipts, which tell that story. He needed to arrange Rs 8,000 in order to travel to Finland. The amount sanctioned by the government had not reached him. Many families in the village agreed to help him out. The 27-year old Jadhav went to Olympics to create history, becoming the first Indian to win an Olympic medal (bronze) in an individual sport. Though not too many Indians have earned Olympic glory in the years since, Jadhav’s story has failed many Indians to remember him in wrestling contests later. But it survives in the taleems (wrestling centres) of Kolhapur, where alongside the photo of lord Hanuman, the patron god of the sport, you will find a framed photo of Jadhav. Jadhav said, DHAK and DHOBI PAAT were his best wrestling daav. Dhak is a technique in which the wrestler holds his opponent in a firm headlock, and then flings him on the ground. It was a move that helped Narsingh Yadav defeat France’s ZelimkhanKhadjiev and win a bronze at the Wrestling World Championships in Las Vegas last year. Jadhav participated in the bantamweight category, and was up against wrestlers from 24 countries. Out of six bouts Jadhav won four, defeating ace wrestlers of the time such as Adrien Poliquin of Canada, PL Basurto of Mexico and F Schmitz of Germany. In the following round, he lost to Russia’s Rashid Mammadbeyov. Jadhav used to practice vyayam (exercise) together with his friends, twice a day for four hours together. Jadhav had great stamina and was the only one who could do 250-300 push-ups at one go and around 1,000 sit-ups. He would attack the opponent with lightning speed and defeat him in minutes. Pune-based writer Sanjay Dudhane’s book on Jadhav’s life, Olympicveer KhashabaJadhav (2001) narrates how his college principal mortgaged his house for Rs 7,000 to send him to the games. To each of his creditors, Jadhav gave a printed receipt, which he took back once he repaid the loan. To be a part of the Olympic opening ceremony, players had to be dressed in formals and Jadhav didn’t even have a pair of socks, leave alone a shirt, a trouser or a blazer. Those, too, he had to borrow. Sushil Kumar won the Bronze medal in 2008 Beijing Olympics. At the 2010 World Wrestling Championships Kumar became the first Indian to win a world title in wrestling. Sushil Kumar won Gold medal at the 2010 Commonwealth Games in Delhi. Yogeshwar Dutt won the Gold medal at the 2010 Delhi Commonwealth Games. He won the Bronze medal at 2012 London Olympics and he is the third Indian wrestler to won the Olympic medal after KD Jadhav and Sushil Kumar. He again won the Gold medal in 2014 Commonwealth Games. He won another Gold in the 65 kg freestyle wrestling category in 2014 Asian Games. Sakshi Malik earned her first bronze medal in the 58 Kg freestyle event at the Junior World Championships in 2010. Sakshi won the Bronze medal at 2014 World Championships in Tashkent. She won Bronze medal at 2016 Rio Olympics in Brazil.